Egg Laying Breeds tend to come into maturity relatively early and so can often be laying eggs by 4-5 months old. They are not very likely to go broody and so lay eggs steadily and in good numbers. Meat Chicken Breeds grow large, and fast. Depending on their intended use (roasters, fryers etc.) they can be ready for the table by as young as 6 weeks old. General Purpose Breeds are good all-rounders. They lay a good number of eggs, but also have a bit of meat on them. 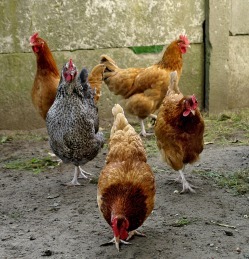 Fancy Chicken Breeds have some kind of fancy feathering such as bearded, crested and/or feathered feet etc. and were originally bred for showing. Get my free Keeping Chickens online magazine (full of articles, tips and subscriber coops!) and the above chicken breeds comparison chart by entering your name and email address below.